Professor Timothy Leighton is well-known for his ground-breaking multi-disciplinary research. University of Southampton Professor Timothy Leighton has achieved a rare ‘triple crown’ for Academicians with his invitation to become a Fellow of the Academy for Medical Sciences. Professor Leighton is one of 48 of the UK’s world leading researchers elected as Fellows, the Academy has announced today (Thursday 10 May). He is also one of four new Fellows invited to address the Academy on its 2018 New Fellows Admission Day (Wednesday, 27 June) at the Royal College of Physicians and Academy of Medical Sciences, London. The term ‘Academician’ is widely used in Russia, USA, Europe and China to indicate someone who has reached the peak of their profession, as marked by an invitation to join the national Academy for that profession (ie the Royal Society for scientists, the Royal Academy of Arts for artists etc). For Professor Leighton, who was already a Fellow of both the Royal Society and the Royal Academy of Engineering, this latest honour secures Southampton’s reputation for leading multidisciplinary research. Indeed, on awarding him the Paterson Medal in 2006, the Institute of Physics called him ‘an acknowledged world leader in four fields' in the citation. Professor Leighton is well-known for his ground-breaking work in different fields, inventing revolutionary sonar and radar systems; pioneering apparatus used to detect leaks from carbon capture and storage reservoirs, and gas pipelines; developing inventions to improve safety in the nuclear and railway industries; and his insights in whale behaviour, ecology, and extra-terrestrial studies. He will shortly be releasing major new findings from his studies on the exchange of carbon between atmosphere and ocean, and the implications for climate change. The Academy of Medical Sciences awarded the Fellowship for the subset of Professor Leighton’s work in the area of Medical Science, which made its first global impact in the 1990s when his research of the safety of medical ultrasound (particularly for scanning the unborn child) led to an invitation from the World Federation for Ultrasound in Medicine and Biology to join a new work group on the safety of ultrasonic scanning. Their work finished in 1998 with the publication of international guidelines citing Professor Leighton’s research, amongst others. Under those guidelines, over 2 billion children, plus uncounted adults, have since been scanned. The citation from the Academy also noted his international legacy from these early years “since the appearance of his monograph in 1994, ‘The Acoustic Bubble’, which was published at the age of 29. In this, he laid out the mathematical foundation upon which much of the recent cutting edge research on ultrasonic contrast agents, drug delivery, and focused ultrasound surgery has been based”. Later work produced similar impact. Tim’s concept of the conical bubble led, via his theory and experiments, to the development of a needle-free injector, which received FDA approval and sold 1 million to date to deliver the migraine drug Sumatriptan, which has a current global market of over $1 billion per year. 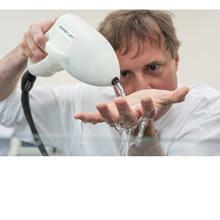 In collaboration with Guy’s and St Thomas’ Health Foundation Trust and Precision Acoustics Ltd., he took a breakthrough in computational fluid dynamics through to invent the LithoCheckTM, a device used to monitor and improve kidney therapy for hundreds of patients (with over 94% accuracy, compared to less than 40% accuracy achieved by clinicians using state-of-the-art equipment). He led the first team (a collaboration between Southampton’s Institute for Sound and Vibration Research and University Hospital Southampton) to model the way changes occur when the same ultrasonic signal is passed in different directions along the bone, and how this can be used to measure bone health, for example to monitor osteoporosis. He also worked with the Institute of Cancer Research on the use of ultrasound to destroy tumours. More recently, Professor Leighton ‘broke’ the story on how the public are being exposed, without their knowledge, to ultrasound in air in public places. He reported that whilst the majority are unaffected, a minority (which almost certainly tends to include children) can be adversely affected. In public sites where tens of millions of people are exposed each year to the ultrasound he and his team detected, this minority becomes a sizeable subset of the population. He founded HEFUA (Health Effects of Ultrasound in Air) which has inspired new research groups around the world to look at the phenomena. There had previously been some international satisfaction that the many national guidelines tended to agree, but after a year of detective work in 2015 Professor Leighton identified that these various national guidelines are in large part not based on independent data, but instead copy one another. He noted that they are in fact based on an inadequate sample of mainly adult males in the 1970s, making them inappropriate for public exposures, especially of children. International bodies have now expressed a desire to revise guidelines, and this week Tim is chairing a meeting in the USA on this topic. 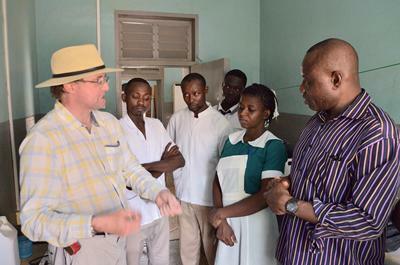 Earlier this year, Professor Leighton returned from rural Ghana where he went to build support for his vision of introducing StarHealer, an invention that cleans wounds and promotes rapid healing, into the Ghana Heath Service Community-Based Health Planning and Services (CHPS). He plans to find funds to equip the motorbikes of the nurses who deliver rural healthcare in CHPs with StarHealers to use in trauma, childbirth etc., in a country where infection is the #1 cause of death.